One of the most popular stops on the poker tour is the annual Aussie Millions Poker Championship. Many players first hit the Pokerstars Caribbean Adventure series shortly after the start of the new year, followed by a trip to Melbourne for the Aussie Millions. The Aussie Millions, which takes place at the Crown Melbourne, is such a popular stop due to the nice weather (January is summertime in Australia), the beautiful city (Melbourne always draws rave reviews) and the Australian Open tennis tournament, which takes place at the same time as the Aussie Millions. Many poker pros are also big tennis fans, which helps to travel some of the biggest names in poker to the event. 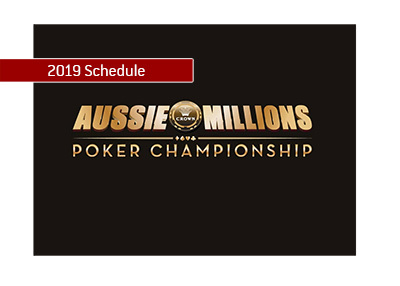 This year's Aussie Millions will run from Tuesday, January 15th to Monday, February 4th, and will feature a total of 27 events. The first event, which kicks off on Tuesday, January 15th, will feature a buy-in of $1,150 Australian Dollars and a guarantee of $1 million AUD. Last year's event had a total of 1,538 entries, which meant that the guaranteed prize pool was easily surpassed. There will be three "Challenge" events with buy-ins of at least $50,000 AUD, with the largest, a $100,000 AUD buy-in event, likely to feature a number of High Roller regulars. Event #11, which is the main event, will have a buy-in of $10,600 AUD and feature three starting flights. Last year's event had a total of 800 players, and tournament organizers are hoping for an even bigger number this year. Tournament organizers are estimating that there will be a total prize pool of $21 million AUD for the entirety of the series.